"Perfect for camping or fun family-style cooking. Pop in all ingredients in a baggie and boil. This recipe can be easily modified to suit the tastes of the consumer. Add salsa or hash browns. Fun for the whole family and is a great camping food since it doesn't require a frying pan. You can even use Egg Beaters® or other substitute." 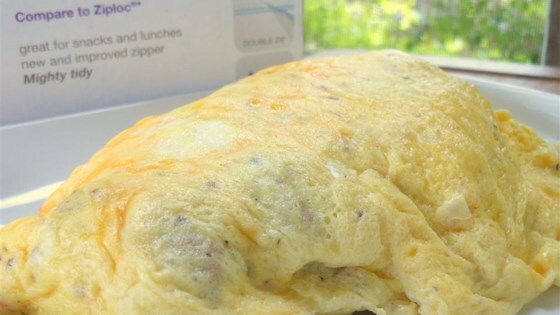 More than one baggie omelet can be cooked at a time, depending upon the size of pot you use. Approximately 6 or so will fill a large pot. Great, but you must use qt. size FREEZER bags. Sandwich size is too small, and food storage bags are too thin and will melt. Definitely use the FREEZER bags! Anything less will spring a leak.